Sojos is a dog food manufacturer, specializing in raw freeze-dried foods and treats. 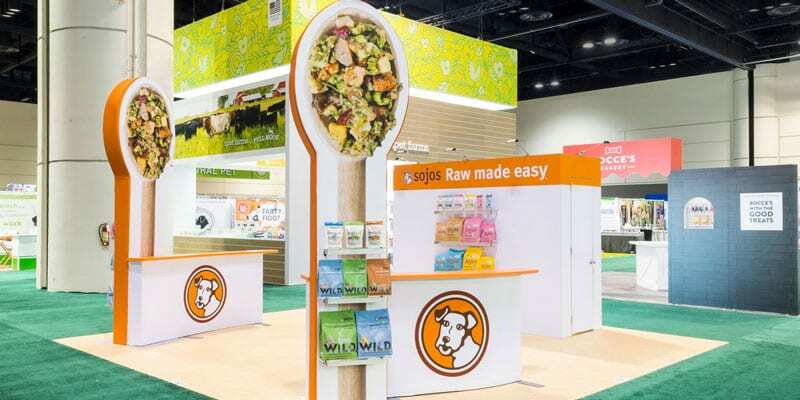 At the 2017 Global Pet Expo, Sojos sought to elevate its brand profile within the pet food industry as well as educate attendees on the benefits of its raw dog food products. Sojos desired an exhibit with a minimalist yet attention-grabbing style to reflect the brand’s personality and products. Sojos partnered with Nimlok Minnesota, to design and build a 20′ x 20′ island exhibit. 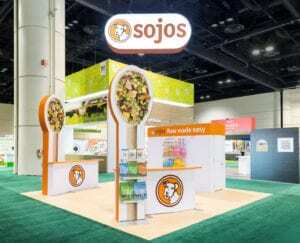 To elevate the Sojos brand, a backlit hanging sign was designed to brightly project the company’s logo, increasing visibility across the show floor. In keeping with Sojos’ minimalist corporate ethos, the exhibit’s backwall was kept simple and included space for shelving to display products. Opposite the backwall were two custom fabricated counters featuring spoon-inspired structures, giving staff an ideal display backdrop to educate attendees on products. Sojos’ exhibit enabled its staff to better engage and educate attendees on the show floor, giving booth visitors a positive and informative experience. Get answers to your questions or find out more about who we are.